This week’s post on Harvard College Library’s zines collection delves a little deeper into how zines are produced, circulated and reviewed. While a previous post on the collection talked about how science fiction fanzines circulated in the ‘80s through the “APAs” (amateur press alliances), this post focuses on how the zines of the ‘90s and ‘00s circulated, and still do, outside of the APA context. To speak of a “typical” zine is an oxymoron; zines are eclectic in everything from subject matter and design, to production and circulation methods. 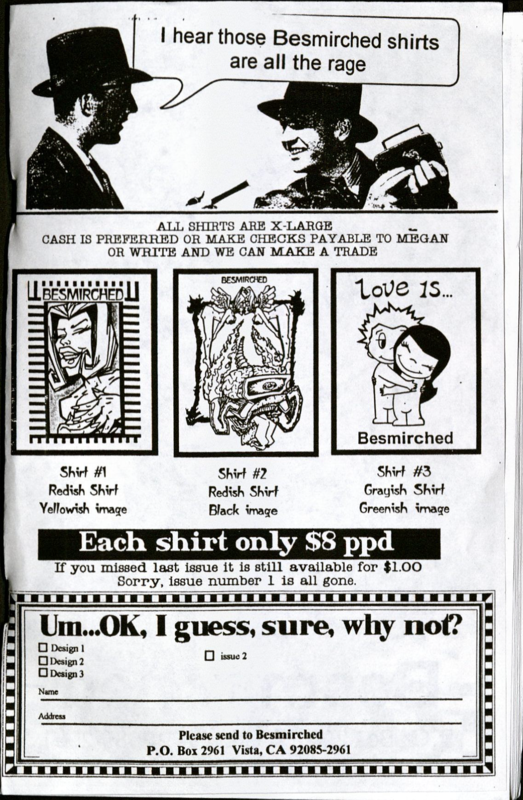 Besmirched #3, the zine chosen for this week’s post, is not so much a “typical” zine, then, as a useful one for thinking about how zines vary. Beginning with the inside front cover (Image 2), the author gives us her first name (Megan) and P.O. Box address; number of copies produced (500); price ($1); states that she accepts trades but no subscriptions; and that she welcomes submissions. In terms of how Besmirched #3 compares to other zines, it is common for zinesters to provide a name (often a first name), although it is impossible to say whether this is their real name or not, and it’s sometimes clear that it is not. Zines are self-published, meaning they are free from editorial control and authors can include what they like (including content that can be deemed offensive because of its political, sexual or religious aspect), and present it whichever way they like, making the fact that zinesters can choose to remain anonymous part and parcel of the freedom zines affords their authors. While most zines cost around $1, some are free or for trade-only, while others cost more. Some accept subscriptions and most (except for the diary-style “perzines” perhaps) publish contributions. One trend seems to be that authors start off writing their zines themselves, with submissions published in later issues as the zine becomes known by readers and people start sending in their contributions. In terms of number of issues a zine can have, this depends entirely on the author. Some stop publishing their zine after a few issues to either start another or drop out of the zine scene altogether, while others go on publishing for years. 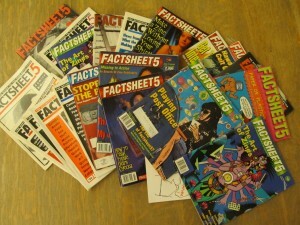 A few publish unique issues, meaning that only one copy per issue is ever produced. Although zines can sometimes have a large print run (i.e. number of copies produced), most are relatively small. As Jenna Freedman of Barnard Zine Library notes in her article ‘Zines are not blogs,” once a zine print run goes into four digit numbers, authors often begin to rely on advertising and outside printers and distributors, meaning their zines stop being zines. 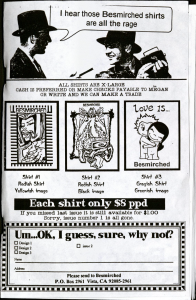 In terms of circulation, the inside cover of Besmirched #3 provides the names and addresses of this particular zine’s distributors. Seven in total, the distributors are all over the United Stated, so not confined to her home state of California. Zines circulate in a variety of ways, with the most common being sales or trade by the author themselves either through the post, or at gatherings, fairs and conventions. At the very bottom of the inside front cover, the author inserts the copyright symbol, copyrighting the entire zine. Although it is not uncommon for zines listed so far from the collection to be copyrighted, most zines seem to be anti-copyright, with some including a note giving explicit permission to anyone (except corporations in some cases) to reproduce any part of the zine they wish. Some strongly argue that being anti-copyright is part and parcel of what zines are about, given the Do-It-Yourself, counter-cultural spirit that can be associated with them. One piece of information not provided on either the front or back cover is whether Besmirched #3 was sent in for review to Factsheet 5 or another zine, which most zines listed in the collection do specify. Factsheet 5 (Image 4) was a comprehensive guide to zines and alternative publications founded in 1982 by Mike Gunderloy. It cataloged and reviewed an abundance of zines – complete with price, critical reviews, and ordering information –and published articles and interviews on the zine scene. The last issue was published in 1998, under editor R. Seth Friedman. Thanks to Alina Lazar for contributing this post. Alina is a second-year PhD candidate in the Department of Romance Languages and Literatures at Harvard. She is one of the initial cohort of Harvard Library Pforzheimer Fellows, working with curator Leslie Morris at Houghton Library to compile a title listing of Harvard College Library’s Printernet Collection of approximately 20,000 zines. The Printernet Collection was assembled by an anonymous collector, and was purchased by Widener Library in 2012. The current project to create a title list is the first step in the process to decide where the collection, or portions of it, might best be housed at Harvard, and how it will be made available for research.